A friend of mine recently directed me to thinkwater.ca to highlight the evils of bottled water. Watching the video I couldn’t help but get frustrated. It is a classic example of progressives misunderstanding the market, and in turn misdiagnosing the problem and engaging in counterproductive strategies. The ad is premised on the assumption that people are misinformed and, if they only knew the truth, they’d change their behaviour. In reality the piece completely misunderstands why people buy bottled water: while there are admittedly some people who mistakenly believe bottled water is safer than tap water, the vast majority of bottled water bought in stores is bought because it is convenient. Consequently this and other campaigns that target the safety and cost of bottled water completely miss the point and are unlikely to impact peoples behaviour. To better understand, let’s dissect the piece’s two arguments. Is tap water cheaper? Absolutely, but it doesn’t come in a container you can take anywhere and then dispose of when you are done. For many people keeping track of a container is – quite frankly – a drag. They don’t want to have to keep remembering where it is and carting it around with them everywhere they go. Bottled water is simply easy. Consequently, they aren’t paying $1.50 for the water – they are paying $1.50 for the convenience of being able to drink a healthy beverage and then dispose of the container. This accounts for why Vancouver and Toronto’s campaigns to hand out drinking containers – in effort to encourage people to drink city water – were misguided and had little to no impact. People don’t want containers – their lives are already cluttered with stuff. The perceived benefit of a owning $1 container is a lot lower then the mental cost of constantly tracking it. Is tap water safer? Absolutely. But absolute safety is irrelevant. The real question is, is bottled water safe enough to drink? The answer to this is obviously yes (do you know anyone whose ever gotten sick drinking bottled water?). The marginal benefit of water that is imperceptibly cleaner is basically zero. Indeed, many people who are drinking bottled water are choosing it over a soda, a slushy, or some other cocktail that truly is filled with obnoxious chemicals and far too much sugar. The health risks of a population drinking bottled water is likely a lot lower than those of a population drinking coke. In this context, raising the specter of health risks around bottled water feels both disingenuous and counter productive. More importantly, your listeners can agree with you, while simultaneously not having it impact their decision making process. Am I defending bottled water? Definitely not. 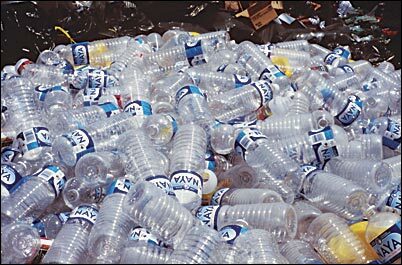 Discarded empty water bottles make up an astonishing amount of waste. However, a population that is drinking water – as opposed to soda and pop – is a good thing. More importantly, people seem to place significant value on the convenience of bottled water – devising a solution that meets this need, rather than fights it, is probably paramount. Consequently there are a few things that could be done. 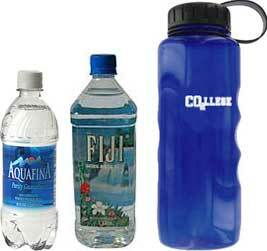 First, water bottles could be standardized – like soda cans and some beer bottles – so that they are more easily recycled. While you are at it, why not slap deposit on those bottles to encourage people to return then to be recycled. Second, create and enforce the law that restaurants and other establishments serve tap water. Often people feel they have no choice but to buy water. Making it clear that you can order tap water would at least give people some choice. Third, why not have the city contract out the right to bottle and sell water? This would reduce green house gas emissions (water would be bottled locally as opposed to being shipped in from who knows where) as well as place tap water on a par with brands like Evian and Dasani. The city could also set a far lower price which would reduce the cost to consumers. (Although if tap water is actually “better” you should be able to charge a premium). Better still, since most cities control their recycling programs it would be easier to ensure that the bottles were washed, recycled and used again, significantly reducing the amount of waste. This entry was posted in public policy and tagged bottled water, city water, Dasani, Evian, progressives, public policy, tap water, thinkwater, Toronto, vancouver on February 7, 2008 by David Eaves. By and large, I agree with you. However, completely aside from the convenience or the health, bottled water simply tastes better than tap water in most cities in this neck of the woods. Companies like Aquafina bottle tap water and, frankly, I find it undrinkable. If municipalities simply filtered tap water I would be far less inclined to drink bottled water. Most of my friends here in Guelph, like me, use glasses to drink out of 10 litre bottles (which cost about $.22/litre, not $1.50/litre) of water, as the tap water is so bad as to be virtually crunchy. Although PET bottles (the type used for bottled water) can be recycled, the material is porous, so it’s not generally advisable to reuse them. When other substances (juice, white fuel for camp stoves, etc. ), they can permeate the material and taint later water. So, when the bottles don’t join the sea of plastic mentioned here they become MEC polar fleece. Don’t cities already contract out the right to bottle and sell water? Since Aquifina and Dasani are just osmotically filtered city water, it seems unlikely that some new vendor would show up and sell for much less. Why, when one can sell for much more? If the city set price ceilings, I foresee hew and cry from commercial bottlers, who would tie things up in court for so long that the city — or or its licenced vendor — would give up. At least that seems to be what happened with municipal WiFi in the US. When government-backed venture compete with commercial operations, current market leaders rarely seem happy. That’s not a reason to avoid it, of course, but it’s certainly another issue that will have to be addressed. The best option seems to be a deposit and refund. That way people might place greater value on the container and be more apt to fill it at their home (even if they do so from a large bottled water tank like the other poster). In the case that it’s discarded, it’s more likely to end up at a recycling or incineration facility and not floating around in the ocean. Although PET bottles (the type used for bottled water) can be recycled, the material is porous, so it’s not generally advisable to reuse them. When other substances (juice, white fuel for camp stoves, etc. ), they can permeate the material and taint later water. So, when the bottles don’t join the sea of plastic mentioned here they become MEC polar fleece.Don’t cities already contract out the right to bottle and sell water? Since Aquifina and Dasani are just osmotically filtered city water, it seems unlikely that some new vendor would show up and sell for much less. Why, when one can sell for much more?If the city set price ceilings, I foresee hew and cry from commercial bottlers, who would tie things up in court for so long that the city — or or its licenced vendor — would give up. At least that seems to be what happened with municipal WiFi in the US. When government-backed venture compete with commercial operations, current market leaders rarely seem happy. That’s not a reason to avoid it, of course, but it’s certainly another issue that will have to be addressed.The best option seems to be a deposit and refund. That way people might place greater value on the container and be more apt to fill it at their home (even if they do so from a large bottled water tank like the other poster). In the case that it’s discarded, it’s more likely to end up at a recycling or incineration facility and not floating around in the ocean. Check out Tappening.com. They’ve kind of become the rage in the states. At least their bottles have. No idea if it’s because of the celebrities that have them? Their press? Their advertising? Or maybe just cut to the chase breakthrough (seemingly simple and obvious) marketing? Maybe it’s just a smart name? I dunno?? Two marketing guys (One of them is considered a guru in marketing circles because he writes books and is on tv all the time-at least I assume that’s why?) who were inspired in part by a Canadian (Andrew Nisker) film maker who produced a documentary I saw called Garbage! The Revolution Starts at Home. Their site has terrific information. Check it out. It answers a lot of questions. And no one south of the border recycles. I just read that slightly under 20% do. I’m NOT drinking bottled water anymore! Check out Tappening.com. They’ve kind of become the rage in the states. At least their bottles have. No idea if it’s because of the celebrities that have them? Their press? Their advertising? Or maybe just cut to the chase breakthrough (seemingly simple and obvious) marketing?Maybe it’s just a smart name? I dunno? ?Two marketing guys (One of them is considered a guru in marketing circles because he writes books and is on tv all the time-at least I assume that’s why?) who were inspired in part by a Canadian (Andrew Nisker) film maker who produced a documentary I saw called Garbage! The Revolution Starts at Home. Their site has terrific information. Check it out. It answers a lot of questions. And no one south of the border recycles. I just read that slightly under 20% do.I’m NOT drinking bottled water anymore! the fact remains that the making and transporting of bottled water creates allot of needless pollution and waste. As for Tappening.com their bottles are made from polycarbonate and it leaches bisphenol-a which is known to cause cancer so before you buy one of their bottles you may want to look into that issue first. Mec has stopped selling those bottles and in my opinion it shows good stewardship they are not out just to make a buck they actually care about the people they are selling to…. the fact remains that the making and transporting of bottled water creates allot of needless pollution and waste. There should be a tax on laziness and we wouldn’t need to tax anything else…As for Tappening.com their bottles are made from polycarbonate and it leaches bisphenol-a which is known to cause cancer so before you buy one of their bottles you may want to look into that issue first. Mec has stopped selling those bottles and in my opinion it shows good stewardship they are not out just to make a buck they actually care about the people they are selling to…. I have developed a Patent Pending product that keeps empty water bottles out of landfills. It gives the empty bottles additional functions, which enables them to have educational, environmental and humanitarian benefits. I have attached a link to an article about the product that appeared in PackWorld. Interesting ideas, David. Any that you would pursue in the coming electoral cycle? I don't see anything wrong in bottled water. As long as it comes from a natural source, everything is just fine. I had the same discussion with someone when I went on a cruise with the Royal Caribbean and I hardly managed to convince that person that there is nothing wrong with this. Anyway, what is important is that I made him believe what I was saying. Looking for attorneys at law? Find it here in [URL=http://http://www.tracyfirm.com/]Tracy Firm – Foreclosure Attorney[/URL]. It’s the best yet in the country.